For your weekend recipe — Northeast Chinese wonton! To be honest, before I came to England, I never thought Wonton soup was so well known, and then, I realized that I never knew wonton could be so different in different regions of China. :))) Compare Northeast wonton to Cantonese ones, the pastry, the filling, the soup base and the way of making them are all different. Actually, where should I start? Probably, the name? — in North East China, wontons are called l hun tun , without need to stress ‘soup’, ‘hun tun’ already refers ‘wonton’ with soup. If you order ‘wonton’ in a restaurant in Northern China, you might not be understood at all. The pastry sheet and the fillings are very similar to Northeast dumplings, even if you want to change the ideas of making one or the other during the process of making, you can just do a simple switch. :) The shape of the Northeast ‘wonton’ looks like ‘Yuan bao’ — an old Chinese money form, and these ‘wontons’ can only be boiled with soup, while Cantonese wonton with ‘prawns fillings’ can be fried. In North East China, Wonton soup is served in a big bowl, with approximately 15 wontons (or more) along with the soup, as a main meal. Normally you don’t need any other dishes on the table, or just some pickles or small salad (liang cai) plate. While in Cantonese cuisine, it is served in a much smaller portion, probably around 4 -6 in one portion in a bowl — as a side dish, never as a main plate. Have I mentioned that Northeast food is also famous for the size of the portions? :)) In most of the restaurants in the region, (or our dining table), the plates or bowls are normally much bigger, thus the portions. :)) So when we went to South China, I was always worried to fill up my big stomach. By the way, the most popular fillings of wonton in Northeast are beef mince (with different vegetables) or prawns with eggs and garlic chives. 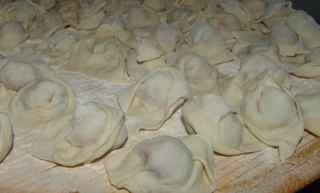 For example, the fillings in my previous postings for Hezi , dumplings all can be used for wonton. Same as dumplings’ fillings, there are also many vegetarian options. 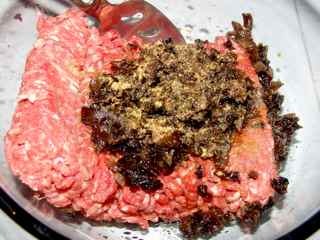 In this posting, I did another filling “beef with black fungus’ (Niu rou mu re). Apart from the fillings, the way making the pastry sheet, wrapping, and boiling is all the same. Beef mince, Mu re (black fungus), spring onion, five spice powder, (or spiced water), salt, oil, sesame oil, light soy sauce, ground sichuan peppercorn, ground white pepper (optional), vinegar (optional), vegetable/mushroom/chicken essence or msg (optional). 1) Making the dough is exactly same as making the dumpling dough . 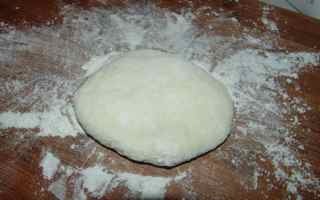 2) Divide the dough into a few smaller portions, and shape the small dough into a round shape, press down. 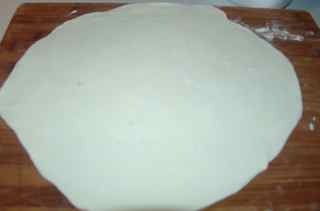 3) Use rolling pin roll the round dough into a big flat thin sheet. 4) Divide the ‘sheet’ into every around 8-10cm width strip. 5) You can dust some dry flour, overlapping them for cutting, or just cutting it like that — into triangle shape, it is ideal if three edges of the ‘triangle’ are at the same length, but it is not necessary. - Keep on doing the rest of the doughs, but make sure that you have dusted enough dried flour in between the sheet to prevent them ‘sticking’ together. 1) Soak a handful dried black fungus in hot water for over 30 minutes. Then rinse and fine chop it into smallest pieces possible. 2) Fine chop 2 whole spring onions. 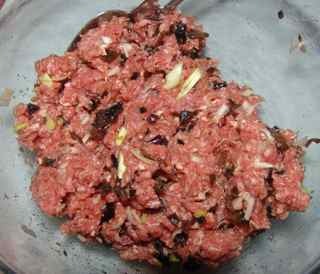 3) Put the beef mince, chopped spring onions and black fungus together in a mix bowl. Add in 1 teaspoon of salt (flat spoon), 2 tablespoons of light soy sauce, 3 tablespoons of oil (if you are using extra lean mince, add a bit more oil), 1 tablespoon of sesame oil, 2/3 teaspoon of five spice powder (or 2 tablespoons of spiced water ), 2/3 teaspoon of vegetable/mushroom/chicken essence or msg (optional). —- Here the filling is ready. (To be continued for the folding, making the soup and serving tomorrow. Sorry, otherwise, it will be too long). Cooking Note: How to cook instant noodles?